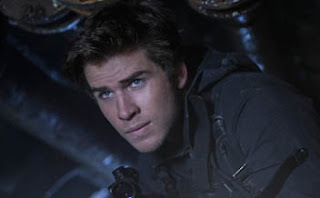 Home » » Liam Hemsworth Reveals Third 'Mockingjay - Part 2' Still On Facebook; "Unite" Teaser Trailer Arrives In U.S. Theatres? Liam Hemsworth Reveals Third 'Mockingjay - Part 2' Still On Facebook; "Unite" Teaser Trailer Arrives In U.S. Theatres? As for Tuesday itself, looks like our hopes that the reveal is indeed the film's first trailer may be coming true as fellow fansite Jabberjays reports that at least one theatre in the United States has received the teaser trailer titled "Unite" (tying in with the hashtag on the poster and the still captions) today, in preparation for next week's theatrical debut with Jurassic World. The teaser trailer file is, in usual Mockingjay fashion, encrypted, so no details apart from the name (The Hunger Games: Mockingjay Part 2 Teaser "UNITE") are available. We hope to be able to fully confirm the existence and the runtime of the trailer on Monday when the full U.S. trailer list for next week becomes available, as well as hopefully information on whether theatres here in the UK have received it. We can't wait for Tuesday's reveal, so stay tuned!